After 7 months of dating E! 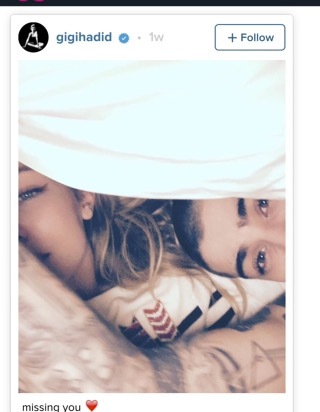 has reported that modem Gigi Hadid and singer Zayn Malik have split. Both have previously been linked to other celebrities too, all music; Hadid has dated Joe Jonas, and Cody Simpson, whereas Zayn was engaged to Little Mix single Perrie Edwards. In times like these we can all band together and belt out Pillowtalk, the video featuring the couple dropped back in the Winter, while remembering the couple. An article from Us Weekly claims Hadid was seen having an emotional and stressful convo with model pal Kendall Jenner this week. But just last week Hadid posted an adorable selfie with the former boy bander with the caption “Missing You <3”. I want to call BS on this one too but I just can’t take more of the Bad Blood squad having a breakup.